The 2018 season has been tough for the Emerald Force women’s soccer team. The team closed out the home portion of its regular-season schedule with a 5-1 Women’s Premier Soccer League loss to Chattanooga FC Thursday night at the Sansom Family Sports Complex’s H.T. Hackney Field. “This was really a tough one for us tonight,” Force coach Pepe Fernandez said. “We’ve had some great individual performances this year and we had a few good individual performances this season, but as a team, it’s just hard to get everybody together. Emerald Force (2-5) entered the 2018 campaign having won the first two Southeast Conference championships. But on this humid and overcast night, it was Chattanooga that won the conference crown. The visiting club’s fans invaded Knoxville Thursday night and celebrated the title with their team. “Our fans traveled well. They came here and supported us when we really needed them,” Chattanooga FC coach Erin Ridley said. “We had a really good game tonight and our fans have traveled with us all year. Chattanooga (6-1) started the scoring early as it tallied three times in the first half. The visitors scored in the fourth, 16th and 23rd minute respectively. Chattanooga got a hat trick from Cass Wade and two more goals from Jess Shepherd. Fernandez could only tip his hat to Ridley and her side after the match. “Chattanooga clinched the championship tonight and they deserved it,” Fernandez said. “They’re good. Chattanooga FC scored two more goals early in the second, putting the Force in a 5-0 hole, but Fernandez commended his squad for hanging in the game and not quitting. 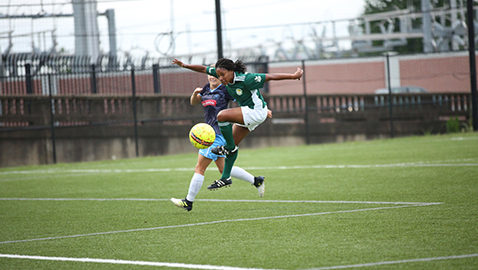 Emerald Force avoided the shutout when Magda Mosengo scored in the 80th minute.